Say what you will, but everyone enjoys a genuine compliment. In fact, Mark Twain said it best: “I can live for two months on a good compliment.” I don’t recommend trading your lunch for it, but I’m sure you get my point. Most of us will have a general opinion about the job we have done on our office design and how things look to others. We may not be completely sold that we have nailed it, but when we get complimentary feedback from others, it solidifies our belief and augments confidence. We at 90 Degree Office Concepts regularly hear the joy of our clients via email or on the telephone as they share the steady stream of compliments they are receiving from clients, vendors, and even passers-by. Getting that steady stream requires showing up refreshingly different. That’s where we come in. 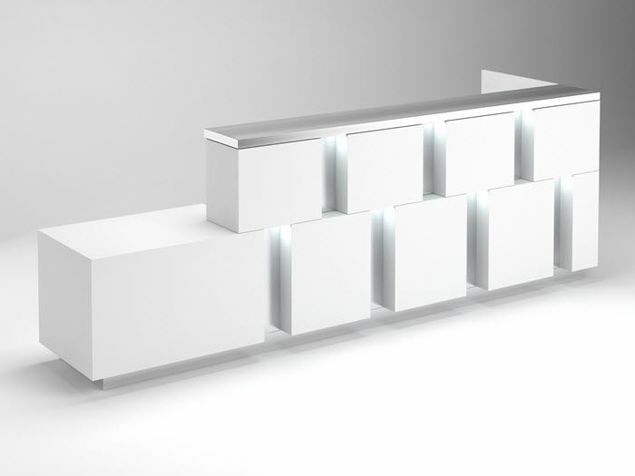 The Corona Modern Reception Desk exemplifies the approach of a forward-thinking company. The face of the Corona replicates stately pillars placed with design flair. 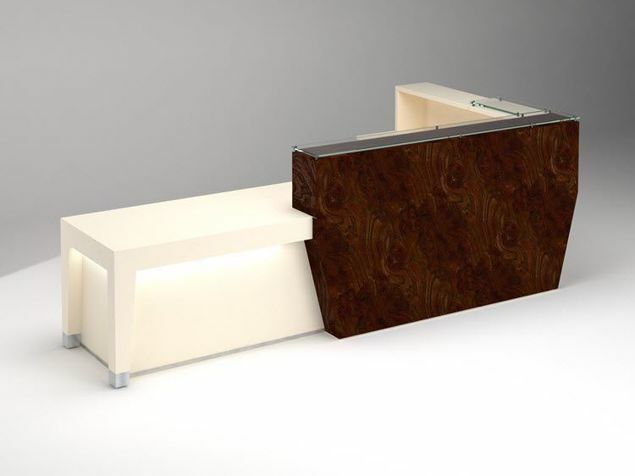 This reception desk allows you to combine color choices and materials to match your company’s design voice. 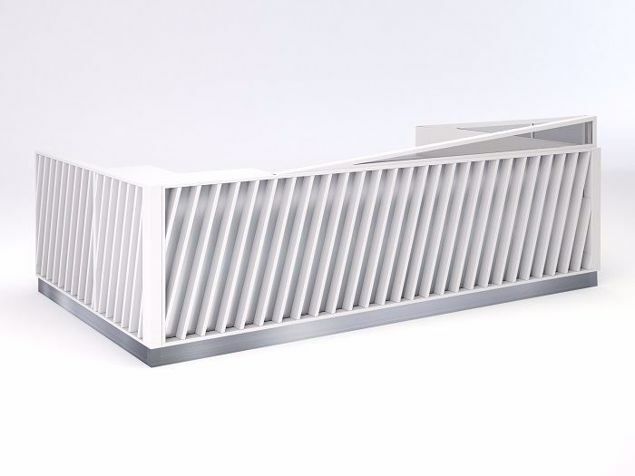 Your reception desk can be your opportunity to get creative. 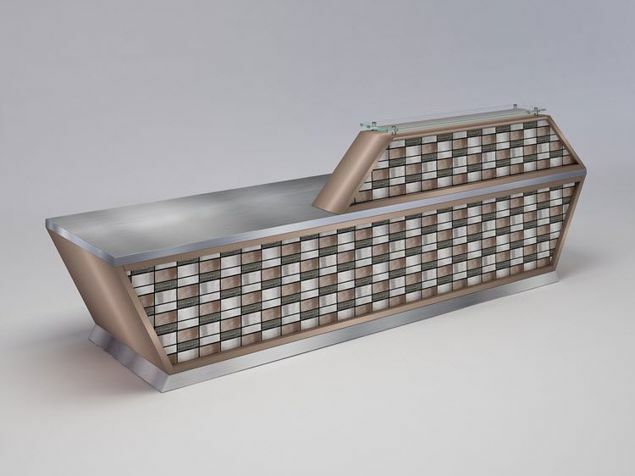 You can start with our entry-level material of HPL, or upgrade to wood veneer, metal, or stone. Select from a collection of audacious or conservative colors and patterns. Make your choice from an entry-level desk at 29" D x 66" W x 42" H, or let us know the size best-suited to your space. 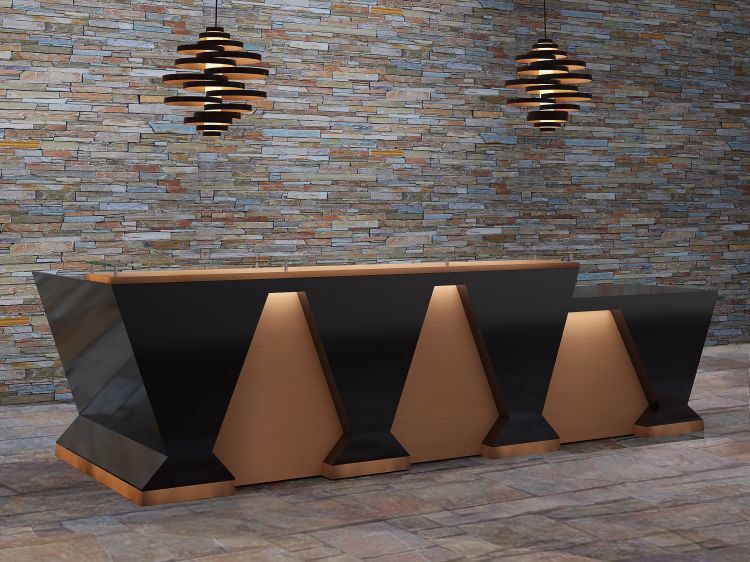 This Corona Modern Reception Desk shown here (32" D x 144" W) is done in a black solid core gloss with brushed copper face, base, and transaction-top accents. The space between the columns is housed with LED pucks. Above the copper transaction top is suspended glass. To be ADA-compliant, we have lowered the work surface for easy access. Priced at $9,311.